It was the most fearful decade of the Cold War, on the heels of the notorious McCarthy investigations. Many people were hunkering down, building bunkers in fear of nuclear attack. But the Levitases chose to throw off the mood of the day and build a modern house of glass where they intended to openly enjoy their Island summers. 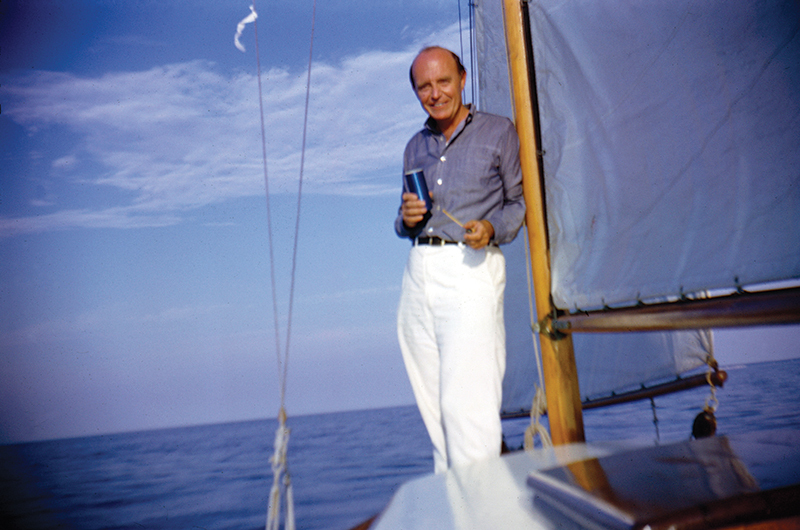 Choosing Geller, who already had a reputation for designing eccentric beach cottages in New York, New Jersey, and Connecticut, was fully in keeping with that adventurous spirit. The Levitases came by their convictions and their love of the Vineyard naturally. Mike’s parents, Sol and Esther, had been renting the same room in the Menemsha home of local fisherfolk Clarence and Mary Morgan every year since the 1930s. Both were Jewish Russian immigrants, and Sol was the longtime executive editor of the anti-Stalin political/literary review The New Leader. The couple appreciated the authenticity of Menemsha and living among working-class people. Like other émigré intellectuals, they were attracted to Chilmark’s early avant-garde culture epitomized by the Barn House, a thriving collective of politically active writers and artists, which included their friend and fellow socialist Max Eastman. 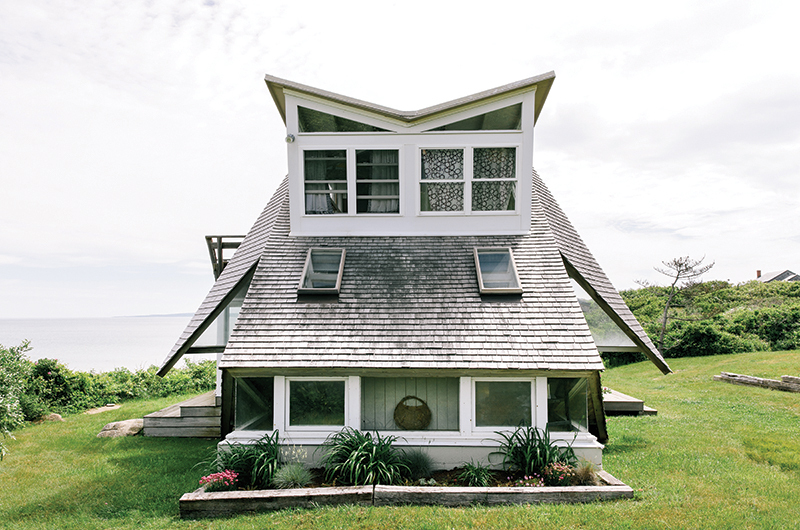 The Levitases’ first Geller-designed Island home, in Chilmark, featured an A-frame intersected by a clean cube-like box. Mike and Gloria, for their part, began to vacation on the Island in 1950, the summer after they married, a marriage that continues to this day. As true socialists, the elder Levitases, Sol and Esther, eschewed homeownership. Not so for the younger couple: after five years of renting various rooms and cottages, in 1956 Mike and Gloria heard at a party about a two-acre lot on the “wrong” side of Abel’s Hill in Chilmark, meaning the area that did not have a reputation for discriminating against Jews and other minorities. That said, the land was very desirable, close to State Road on an expansive hillside site that offered lovely meadow and distant water views. And the price, $2,000, was right. They jumped. At the time, Mike was a rising journalist writing for Voice of America, the New York Post, and Time magazine, notably winning the prestigious George Polk Memorial Award in 1957 for his reporting on labor unions. Gloria was a busy editor for the noted mystery and crime publisher Mercury Press, where her male co-editor referred to her as “an all around genius…a demon line editor, never overlooking a typo or cutting a clue while whittling a 200-page thriller to half of its original size.” The couple exemplified the new generation of New York’s post-war intellectuals, less esoteric than the previous one and more focused on social issues of the day, such as the civil rights movements, economic inequality, and eventually, the Vietnam War. Passionate about their work, neither Mike nor Gloria chose fields that would necessarily make them rich. But Chilmark was relatively cheap in the 1960s, and while they bought their property at first to camp on it, they were delighted to discover they could probably afford a beach house. Their good friends Mitch and Arthur Pearlroth had recently built an unusual home in the Hamptons that became known as the “brassiere” house. It was as distinguished for its upended double-diamond façade (hence the bra moniker) as it was for its $8,000 price tag. The architect was Geller, whose career had taken off after an earlier beach house in the Hamptons was featured on the front page of the real estate section of The New York Times in 1957. It was designed for Elizabeth Reese, the public relations director for Raymond Loewy and Associates, where Geller worked, and it became the first of fifteen summer homes he completed between 1957 and 1961. In contrast to the sleek, international, modern houses still popular at the time, Geller’s designs were gravity defying compositions of geometric shapes and volumes. Every house was different, each whimsical, fun, and affordable. Thanks to Reese’s publicity skills, many of these, including the Pearlroth and Levitas houses, ended up in some of the most popular magazines of the day, including Life, Esquire, House and Garden, and Sports Illustrated. Geller’s free-form houses were a natural outcome of his creative upbringing – his first mentor, his father, was a graphic designer and fine artist – as well as his lack of formal architecture education and his diverse on-the-job design experience. Raised in middle-class Brooklyn, he studied art from an early age at the Manhattan High School of Music and Art and completed high school at a technical institute where he acquired practical drafting skills. He entered the Cooper Union for the Advancement of Science and Art, a private college in Manhattan where he studied both the fine arts and architecture, but left before graduating to serve during World War II. (He would eventually receive his degree from Cooper Union’s Night Architecture School in 1947.) Exposure to mustard gas during training landed him in a Texas hospital for six months and left him with lifelong skin and lung damage. During his hospitalization he read a Life article on Raymond Loewy’s design firm and was fascinated by the diversity of his projects, which included everything from train engines to lipstick tubes. He was also introduced to Loewy’s concept of streamline design – designing objects, regardless of size or scale, as simply as possible to create with each a distinct and memorable impact. After he recovered, Geller returned to New York. To complete his Army commitment he designed ship interiors for the Navy and worked with the Army Corps of Engineers. In 1944 he married Shirley Morris, a painter he had met at Cooper Union, and they eventually settled in Brooklyn, where he freelanced on a variety of designs, including the product shelving for the original Macy’s department store. In 1946 the couple built their first home, a True Value prefabricated tract house that fascinated Geller for its simplicity and no-nonsense construction. A year later Geller landed a job with Loewy, for whom he worked for twenty-seven years, becoming chief designer and eventually the firm’s vice president. the house. To this end, Geller popped out a room on either side of the A-frame that resembled opened flaps of a tent and housed two more small bedrooms and a bath on the second floor. 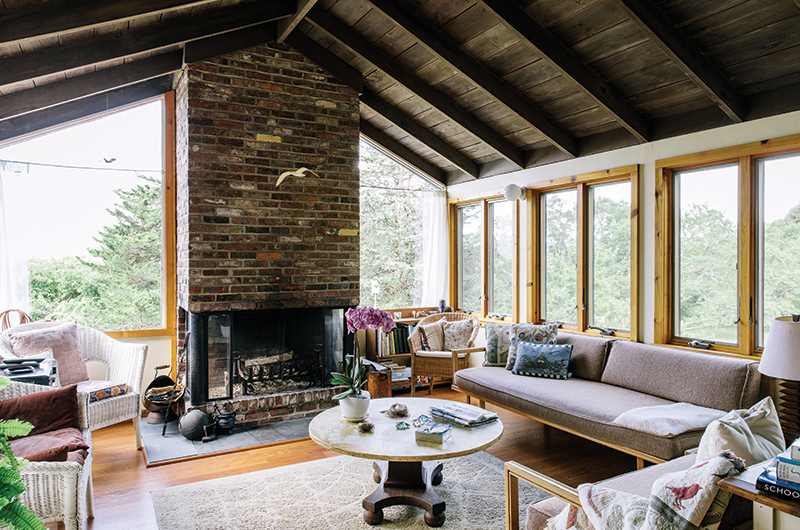 In spite of local skepticism, the Levitas family cherished their modern Chilmark A-frame. 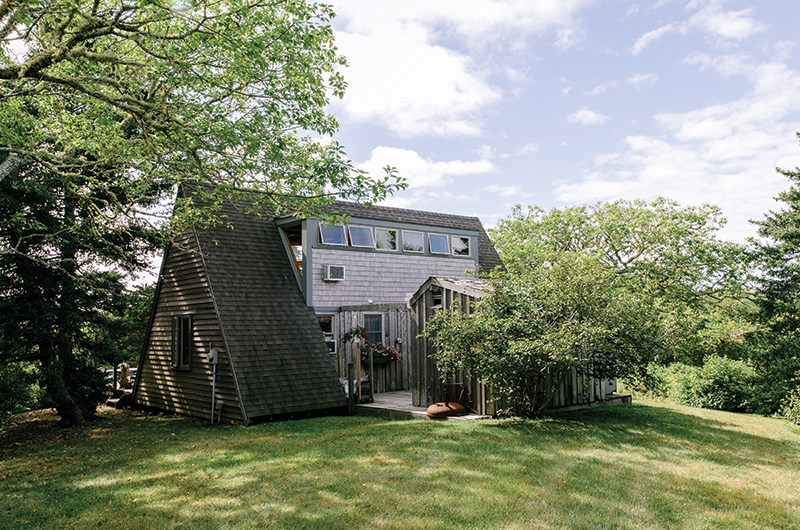 They even sought out the other Island A-frame owners, Mount Everest trekking pioneer Woody Sayre and his wife Patricia of Vineyard Haven, with whom they jokingly commiserated about the architectural provincialism they were both forced to endure. When Sol Levitas died in 1961, Esther began staying with Gloria and Mike to spend valuable summers with her grandchildren. The family socialized with their close neighbors, including the family of Robert Solow, Nobel laureate in economics. They frequented the legendary Blue Mailbox Beach, which later became Jungle Beach and is now Lucy Vincent Beach. As magical as that beach is, the long schlep, with children in tow and copious amounts of gear, through thick swampy marshlands grew increasingly less romantic. It was, Gloria said, the impetus for eventually seeking a house closer to the water. 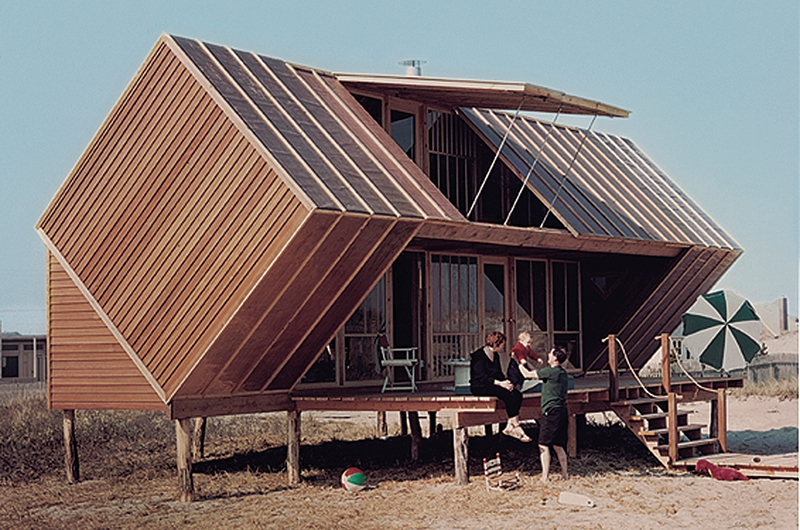 A master of modern relaxation, Andrew Geller developed a reputation for designing whimsical, gravity-defying beach houses throughout New York, New Jersey, and New England in the late 1950s and ’60s. Although the family would keep the Chilmark house through the mid-seventies, in 1961 they came across a five-acre beachfront lot in Gay Head. Some friends questioned their decision to leave Chilmark for Gay Head’s remoteness, but the property was attractive for its direct beach access and affordability. In addition, in this more remote and less regulated community, the Levitases could fulfill their first dream: to build a Geller house that was more radically creative. The Gay Head house was finished in 1963. In the decades since its completion, various architectural critics have compared the house to a seagull, a kite, or most often, origami. However you describe it, the house signaled a shift in the nature of Geller’s architecture as the optimism of the postwar fifties gave way to unease in the sixties. Where his early houses were playful and open geometric compositions, in the sixties he increasingly shrouded the more exposed rooms of the home with swaths of carefully placed walls, creating a visceral sense of protection while still allowing strategic connections to nature. Straddling the decades, the Levitas house is both a more abstract and a more closed form than the houses that came before. The core of the building, a transparent box, contained a two-story public living space with a cantilevered deck off the upper level overlooking the ocean. On either side of this box a solid shingled roofline composed of large sail-shaped panels tethered the house to the dunes and shielded the glass-clad living rooms from the approaching road. Geller sited the house such that the formal entrance faced the ocean and not the street. The exposed bluff location inspired the angular forms of the roofline, which Geller thought would yield aerodynamically to prevailing winds. The utilitarian sleeping bays, baths, and kitchen were squeezed under the opaque roof panels. These panels were punctured with small slits of triangular glass that let in air and light, and also created framed views of the ocean and landscape. The resulting house was highly distinctive even among the other mid-century modern houses on the Island. His design expanded the idea of what a modern house could be beyond its utilitarian function. Following a fresh trend in architecture exemplified by the fluid aesthetic of Eero Saarinen’s swooping New York TWA terminal, the house welcomed comparisons elicited by unique place and context, in this case the many comparisons to sea birds, the ocean, and the windy site. The house demonstrated a move away from modernism’s universalizing concepts and instead embraced inspiration from culture and history. In fact, seen from a distance with its vast cedar roof-lines, the house was also compared to barns found in the region, a nod to Island vernacular. One of Geller's whimsical beach houses. The Levitas family spent about a month at the Gay Head house each summer, renting it the rest of the season to a loyal returning clientele. The early years were quintessential 1960s Vineyard. At a very young age Tony and Danny could safely hitchhike the entire Island. Gloria drove an old camper van, ready to pick up a needy rider. The boys learned to sail on Quitsa Pond, where as a teen Danny conducted sailing lessons, an enterprise he eventually turned over to the community center. The family cherished the sandy trail alongside the house that led down the forty-foot cliff to their 1,800-foot beach. Even after four neighbors were injured at a party in 1964 when the second story deck collapsed for reasons never resolved, they continued to enjoy entertaining neighbors: the event made the front page of the Vineyard Gazette, but thankfully left no long-term damage to their Island relationships. “The house was so exciting; no matter how many times we came back to it, we were newly thrilled,” they wrote to the Gazette. Around 1968 the family decided they needed to enlarge the bedrooms and study on the second floor and open the house with more ventilation. This time they worked with Bonnie Roche, a New York architect whose plans popped out the rooms symmetrically through the opaque rooflines, creating tent-like flaps much like Geller had done on the Chilmark addition. She also shored up the second story deck with additional posts and beams, enclosed a large part of the lower deck to create an indoor seating area, and re-angled the exterior decks to orient them to the shoreline and sunset. Pleased with the addition, Gloria recalled how some of her Wampanoag neighbors had seen the original Geller house as a “wounded gull,” referring to its tethered wings. Then after Roche’s interventions were complete, they proclaimed the gull’s wings had been lifted and it could once again take flight. Gloria’s connections to her Wampanoag neighbors grew deep over the years. In the sixties, in addition to raising her sons and running her households, she had continued as a freelance writer and pursued an academic career in anthropology. Her dissertation, which she completed in the mid-seventies and which was published in 1980, was a thorough examination of the culture of the Wampanoag Tribe of Gay Head from its ancient past to the present. The book, along with her rejoinder to the Bureau of Indian Affairs’ argument against tribal sovereignty, became seminal documents in the tribe’s successful struggle for federal recognition that culminated in 1987. Mike was no less busy. In 1976 he became the editor of the Metropolitan section of The New York Times, and over the course of a thirty-seven-year career at the paper he assumed many other roles, including editor of the Op-Ed section and the Book Review, and eventually headed up its book development department. Through it all Mike and Gloria valued their vacations in Gay Head at their unique house. In the late seventies, however, the family reluctantly decided to sell the Chilmark house to pay for their sons’ college tuition. Barbara and Roy Pesch bought the Chilmark A-frame and, along with their three sons, spent many summer vacations at the house, which Barbara still owns. An avid birder and coauthor of Vineyard Birds (Concord Press, 1983)with Susan B. Whiting, she and her sons have sparingly restored and upgraded Geller’s original house, making no changes to the overall design. Barbara extends her seasons now from April to October or as long as the house allows, connecting with cherished friends she has made in the near fifty summers she has vacationed on the Island. Geller’s second home for the Levitases was more radically creative than the first, often drawing comparisons to origami, a kite, or a seagull. workers’ compensation attorney and Tony is a political scientist and consultant at Brown University – maintain the house on an as-needed basis with as much sensitivity to the original Geller design as reasonably possible. They did build a separate traditional cottage at the back of the property, which they primarily rent or use if the main house is occupied and they need to be on Island. Since the Roche addition, however, nothing has substantively changed in the original Geller design beyond replacement of weatherworn materials or the fixing of the occasional leak.